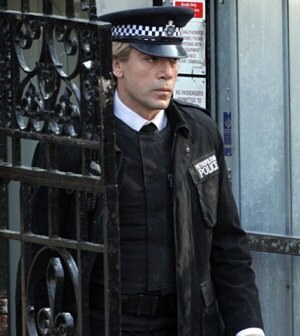 In a step up from previous Skyfall publicity memes like #Banal007 and James Bond's Big Gay Resort brochure, the Daily Mail has a glimpse at Javier Bardem in character as the film's as-yet-unnamed villain. The catch: He's in costume as a police officer. Where have we seen this before? 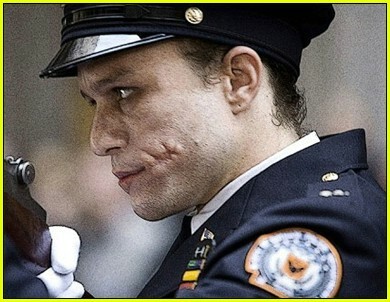 As other observers have pointed out, the blockbuster-franchise-baddie-as-cop routine perhaps reached its zenith in The Dark Knight, featuring Heath Ledger's Joker impersonating one of Gotham City's finest before busting loose with an assassination attempt. Bardem's character has the same malevolent scowl; I doubt he's charged with issuing parking tickets on double parked Aston Martins, but who knows? Ha! Speaking of Badass, there's a guy who lifts at my health club who looks just like Danny Trejo, and I heard him talking the other day and he sounds like him too. So flippin awesome. No Country for Old Men, one of my favorite baddies of all time ... is this guy type casting himself. I guess if he is so good at it and makes big bucks, I cant blame him!